Mobilität. Mit dem Dell Vostro 3350 Subnotebook stellt sich das kleinste Gerät der Dell Vostro Neuauflage zum Test. Dank großem 8-Zellen-Akku, der beleuchteten Tastatur und aktueller Hardware von Intel und AMD muss sich der Zwerg mit 13,3-Zoll-Bildschirm in keiner Weise verstecken. Der Grundgedanke eines Notebooks lautet Portabilität. Damit Sie das richtige Gerät als Ergänzung zum stationären Rechner finden, testen wir sechs Notebooks bis 14 Zoll. Plus: Flüssige Arbeitsgeschwindigkeit; Hochwertig verarbeitet. Minus: Dunkles Display (aber kaum Spiegelung). Das Dell Vostro 3350 hinterlässt als kleinster Vertreter einen größtenteils guten Eindruck bei uns. Das kompakte Chassis mit ansprechendem Design überzeugt, wobei minimale Probleme bei der Stabilität und in der Detailverarbeitung bleiben. Der Schnittstellenumfang und die Kommunikationsmöglichkeiten sind ausgereift. The Dell Vostro 3350 is an excellent portable laptop with rock-solid stability and good performance for most day-to-day computing activities. The 13.3" anti-glare display is easy on the eyes, while the ergonomic keyboard is a joy to use. While the Vostro series is marketed as "business laptops", calling it so might not be completely true, because the only business-related feature present here is the fingerprint scanner, while other features such as TPM are absent. Those seeking a multimedia laptop will be disappointed by the poor speaker performance, but they can certainly hook up a pair of headphones instead. The Intel GMA 3000 graphics limits its gaming capability. Thanks to the powerful 8-cell battery, the power backup time is very good. The Dell Vostro V3350 sells at a market operating price in India of Rs. 45,990 and may be available in your area for lesser. This is a pretty good laptop overall and as Dell mentions, this is targeted at small business users. However, if you think this laptop fits in your budget it would be an ideal choice for anyone looking to upgrade from an older laptop, netbook or just looking to purchase a stylish looking laptop that's a good performer as well. The oversized bezel around the display also plays home to the webcam, which - if you’re anything like us - will probably get used for the occasional Skype call and little else. To the rear of the laptop is the power socket, plus the high-capacity battery - which, sadly, makes the laptop feel a bit unwieldy in use. Sticking out from the base, it provides a comfortable tilt for easy typing when you have the Vostro on a desk, but we found it uncomfortable to use for extended periods of time. With its attractive aluminium shell in a choice of three striking colours, general ruggedness, excellent usability and great connectivity - combined with some decent specs - Dell's 13.3in Vostro 3350 is well worth its asking price, despite an average screen. Admittedly its high-capacity battery makes it somewhat heavy and chunky, but then you do get to stay away from a socket for hours at a time. Frequent travellers looking for a portable laptop that doesn’t sacrifice an optical drive for mobility will appreciate the Vostro 3350; it combines superb battery life, fast performance and excellent styling into a compact package at a reasonable price. Battery life with the 4-cell battery was an astonishing 9 hours on average, which blew away pretty much the rest of the competition. 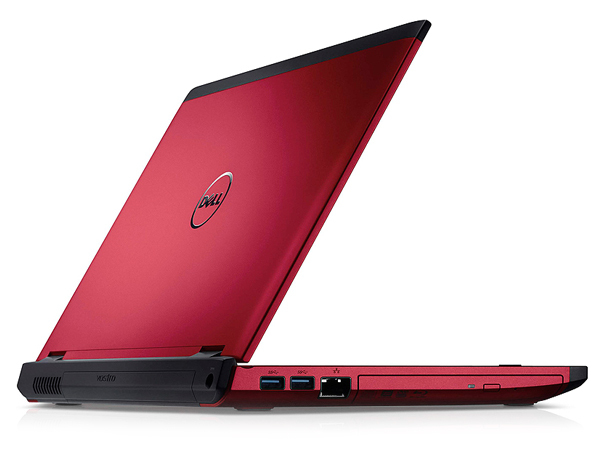 Dell's Vostro 3350 laptop was originally designed to appeal to the firm's business customers. It's not quite the perfect ultra-portable laptop, but the Vostro 3350 is a great option for any non-gamers who want to combine good performance, long battery life and a tough exterior in a single compact form factor. But whatever you do, don't use the speaker! The Dell Vostro 3350 not only delivers very good productivity and graphics performance in a thin-and-light chassis, but it also offers small-business users IT-level support direct from Dell without the overhead required to staff and maintain a dedicated IT department. Even with the bulky battery, this versatile notebook is light enough to take anywhere and is built to withstand the rigors of frequent travel. 74.54%: Diese Bewertung ist schlecht. Die meisten Notebooks werden besser beurteilt. Als Kaufempfehlung darf man das nicht sehen. Auch wenn Verbalbewertungen in diesem Bereich gar nicht so schlecht klingen ("genügend" oder "befriedigend"), meist sind es Euphemismen, die eine Klassifikation als unterdurchschnittliches Notebook verschleiern.